In an unprecedented move PML-N delegation went to MQM center 90 and requested for MQM votes in favor their presidential candidate Mamnoon Hussain. MQM announced unconditional support to PML-N. The ruling party has also offered MQM to join the government in center. This development has come as a surprise to many. To me this is the biggest political tragedy that has happened to the nation within just two months of the change of government. PML-N had no compulsion of entering into alliance with MQM. The number game is clearly in favor of PML-N, both at government and presidential level. PPP has this compulsion hence they had to oblige MQM at the peril of Karachi and Pakistan. It was PML-N who had been the most aggressive critique of MQM, its politics of violence and its alliance with PPP. Even while framing Charter of Democracy, PML-N had placed the condition that no party will ever make alliance with MQM. Doing exactly the same thing after coming to power by the PML-N is not understandable. Elections 2013, whatever their status regarding the allegations of rigging be, had given a golden opportunity whereby MQM was deprived of its nuisance value of political blackmail. At the federal level PML-N was having a comfortable majority and in Sindh PPP could make government without MQM. But unfortunately this opportunity has been smashed by the wrong initiative taken by PML-N. The support of MQM to PML-N will never be unconditional. It will have its many tags attached to it as usual. May be that their governor in Sindh is being retained? May be that legal cooperation of Pakistan government with British police in Imran Farooq murder case will be blocked? May be that MQM is again given a free hand to play with the life and property of citizens in Karachi and to protect its criminal gangs from prosecution? And all this at what cost? Just few votes for the presidential candidate who could otherwise make to his office? PML-N will have to give full justification of their U-turn in policy to their supporters and voters, who have entrusted them with power to see a meaningful change in Karachi situation. It is feared that we are heading towards another round of bloodshed, lawlessness, and destruction in Karachi. Najam Sethi has termed this move as ‘excellent political strategy’ on the part of MQM and PML-N. If this is excellent strategy then what was the notorious policy of ‘reconciliation’ of PPP? If such strategies are considered admirable then any ruler of the country will be justified to join hands with the criminals, decoits, looters, smugglers, exploiters, terrorists, kidnapper, murderers and miscreants to keep them happy. Those elements will be more than satisfied to enter into alliance with the government to enjoy protection of the state and will play havoc with the lives and properties of people with impunity. PM Mian Nawaz Shareef will be expected to satisfy the people of Pakistan on this crucial policy matter. This entry was posted in Politics and tagged Expectations, Karachi, MQM, Nawaz Sharif on July 27, 2013 by akhterhayatmalik. The news are in circulation that many of our media persons are on the payroll of foreign powers. They have been tasked to tarnish the image of Pakistan Army and negate the ideology of Pakistan. There can be no written proof of such payments to these journalists which are aimed at purchasing their conscious. One has to see their actions and listen to their words very critically. These people are so subtle in their way of action that a common person may not notice any abnormality in their conduct. One has to read in between the lines to get the truth. The way they target our national interests and embarrass our patriotic ambitions is really “Fantastic”. American President Obama had declared in public that the US government has kept $ 400 million for Pakistani media. It is absurd to think that this amount will be paid to anchors / journalist who are promoting ideology of Pakistan and Islam. It may take years for someone to understand the methodology of the paid and sold out media persons. They will never come out openly against our national interest because if they do so they will be exposed and neutralized. So far no action has been taken against these people in Pakistan. There are two main reasons for this. One, that so far we have been ruled by people who are themselves slaves of foreign powers, so they will not harm the interests of their masters. Two, our internal accountability system, like judiciary, is not geared to dispense justice in the national interest. When our Chief Justice sets free the terrorist guilty of carrying out lethal attack on GHQ, on the plea that ‘the evidence against the terrorists was gathered by the investigators and did not come to us from impartial sources’, how can someone expect him that he will punish traitors in media? Supreme Court is not ready to even make public the Media Commission Report that contains lot of material against corrupt media. The national institutions like ISI have lot of information on these people. But these institutions may be reluctant to take this issue in the courts for the reasons as mentioned above. The best remedy available so far is the social media and public pressure / protest against such traitors in our media. Once these criminals are exposed properly they will lose their moral ground to operate against the national interests of Pakistan. This entry was posted in Security and tagged Hamid Mir, Najam Sethi, Pakistan media, Supreme Court on July 21, 2013 by akhterhayatmalik. A discussion is going on whether Imran Khan and Dr. Tahirul Qadri should launch a joint effort to change this system or not. Some people think that Dr. Tahirul Qadri was right by saying that this system will not allow any meaningful change through elections. He wanted to change this system through peaceful public pressure and introduce electoral reforms. But no one in Pakistan joined hands with him. His movement . long march and ‘Dharna’ remained an isolated effort and thus did not produce desired results. There is no doubt that IK has done much more service for the nation as compared to TuQ. However as TuQ doesn’t believe in existing electoral system so he has not and will not, make an effort WITHIN THE SYSTEM. TuQ said that no change is expected from existing system and the system has to be demolished if you want to bring change. 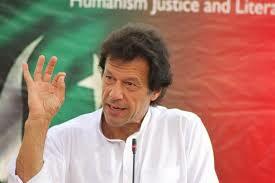 The elections 2013 have proved it beyond doubt and IK has also acknowledged it by saying that ‘TuQ was right’. The point to ponder is that if IK has acknowledged the validity of TuQ’s words then what to do next? Should we keep repeating the same electoral process again and again and at the end keep saying that the elections were rigged? The present corrupt and rotten system will never allow an honest and patriotic leadership to come to power. This system has to control only 10 people to play with the fate of the nation. 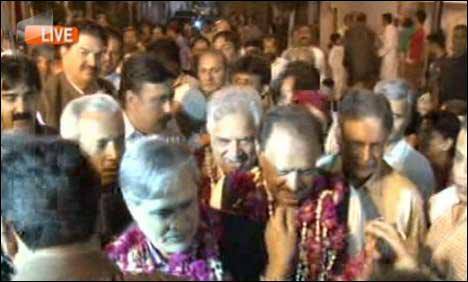 These 10 people include 5 members of Election Commission and 1 caretaker PM and 4 caretaker CMs. This system has done the same in recent elections and has baffled everybody around. So what do you expect in future? Will this system allow any transparency and impartiality in future elections? What would stop this system to commit rigging in next elections? Please note that this system is NOT ALLOWING PTI EVEN TO RECHECK THE THUMB IMPRESSIONS IN JUST 4 CONSTITUENCIES! It is totally absurd to expect any good from this system. Be assured that if IK participates even in 10 more elections with his present profile of an upright and honest leader, he will not be allowed to make his way to the corridors of power. Yes of course, if he makes compromises with the powers of status quo, both within the country and outside, he will be allowed to form the government. The real power of a revolutionary leader lies in his ability to mobilize the masses on streets. These are the teeth of a leader with which he can bite the corrupt system and compel it to bow down before the aspirations of the masses. Due to many factors TuQ could not mobilize the masses on vast scale so as to compel the system to surrender before the people but he gave a ray of hope and a line of action that such things can be done. I don’t know whether TuQ will ever make a comeback. If he comes back then it will be an additional advantage for the change seekers like IK. But if he doesn’t come back the whole burden of bringing change will squarely lie on IK. One day IK will have to come on streets if he wants a real change. This system has to be demolished from top to bottom, otherwise there is no chance of any improvement. Just take example of PTI government in KPK. Do you believe that this corrupt system will let PTI make KPK an exemplary province? Not at all. So far the federal government is entangled in many other serious issues. Let them be free from that and you will see how many hurdles are created in the way of KPK government. This entry was posted in Politics and tagged Corrupt Electoral Sysytem, Imran Khan, Pakistan Tehreek-e-Insaf, Tahirul Qadri on July 21, 2013 by akhterhayatmalik. The Martyrs’ Day, also known as Youme Shuhada-e-Kashmir is observed on July 13 every year on both sides of the Line of Control and throughout the world by the Kashmiris to pay homage to 22 Kashmiris who were martyred in 1931 while protesting against the brutalities of Dogra rulers. The day carries lot of importance in the history of Kashmiri struggle against foreign occupation. On 19 April 1931, Holy Quran was desecrated in Srinagar by the occupation Dogra forces. During a protest rally a Kashmiri youth Abdul Qadir pointed his finger towards the palace of Maharaja and shouted, ‘Destroy every brick of it’. The youth was charged with high treason and taken to Central Jail Srinagar. On 13 July 1931 thousands of Kashmiri Muslims gathered around the jail to witness the in-camera trial of Abdul Qadir. When the time of prayers approached a Kashmiri youth stood up for Azan. The Dogra governor ordered his troops to fire. The youth got martyred before he could complete the Azan. Another youth stood up for Azan. He was also shot and killed. In quick succession 22 Kashmiri youths stood to complete the Azan and embraced martyrdom. The incident shook the whole State, Kashmiri people rose in protest and the traffic and life in the Valley came to standstill. 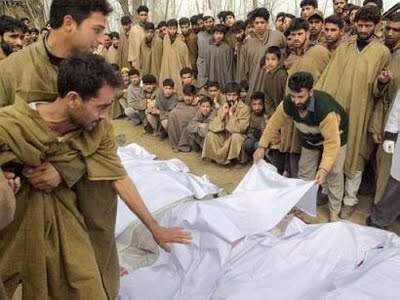 Like Kashmir and the world around, Pakistan has also been observing Youme Shudaha-e-Kashmir on July 13 in the past to show solidarity with the hapless Kashmiri. However with the passage of time as our media, the journalists and political paradigm has been influenced, rather taken over by pro-Indian lobby, such activity is no more visible at national level now. Today we are being ruled by PML-N in center, Punjab and Baluchistan who is considered to be guardian of Ideology of Pakistan. Have you seen any ceremony/ conference/ seminar being organized officially to show solidarity with Kashmiri people? Where is Chairman Kashmir Committee (Maulana Fazlur Rehman) on this historic day? Where are our freedom lovers and champions of human rights on this day? Have our TV channels conducted any meaningful programs in this regard? We as a nation are committing the unforgivable crime of forgetting our martyrs. Remember, the life of a nation thrives on the blood of martyrs. A nation who forgets its martyrs virtually surrenders its right to live as a free entity in the comity of nations. This entry was posted in History and tagged Abdul Qadir, Dogra, Kashmir, Srinagar on July 14, 2013 by akhterhayatmalik. “ISLAMABAD: In the first hundred days of his third stint as the Prime Minister, Nawaz Sharif has to take an important decision of making three new four star appointments, including those of the Army Chief, Naval Chief and Chairman Joints Chief of staff Committee. Holding the additional portfolio of defence minister, PM Nawaz Sharif will also be considering approving a major reshuffle in army top brass in the first week of October as CJCSC, General Khalid Shamim Wyne, and two Corp Commanders, Lt General Khalid Nawaz Khan and Lt General Muhammad Alam Khattak prepare to call farewell to arms. This will set in a major reshuffle in the top military brass and lead to promotions for the posts of CJCSC and atleast five Corps Commanders before the retirement of General Kayani. In a couple of detailed background meetings with journalists, General Ashfaq Pervez Kayani has ruled out taking any more extensions when his six year tenure as Army Chief comes to an end in November this year. General Kayani is the only COAS who was given an extension of three years by a civilian government five months prior to his retirement in July 2010. Aides close to PM Sharif believe the decision will be taken on “merit” and “seniority,” giving enough leeway to the government to pick the next COAS from amongst the top generals by considering the two criterions to judge the professional competence of the officer. Sources in the PM Office say the matter of appointment of service chiefs is highly sensitive and all cards are being kept close to the chest by the PM. However, discussions have taken place on the issue in close door quarters of the Sharif camp. Considering the way key appointments have been made in the civilian bureaucracy, it is doubtful if the PM has learnt any lessons of preferring loyalty over merit, with loyalty still being the top most priority for the Sharif brothers. Loyalty was among one of the factors PM Sharif considered when his brother Shahbaz Sharif and trusted lieutenant Chaudhry Nisar advised him to overlook the seniority principle and appoint General Musharraf as the COAS in October 1998. The Sharif family had to pay heavily for the decision just a year later when his hand-picked general staged a coup d’état in October 1999 and put the then Prime Minister in the 16th century Attock Fort. If the PM adheres merely to the seniority principle in appointing the next Army Chief, there is very little left to guess as to who will be the next Army chief. If the seniority principle is applied sensu strictu, Lt General Haroon Aslam would be the senior most in October, followed by Lt General Rashid Mehmood. Technically, any of the Lieutenant Generals could be appointed as the COAS but practically that is not possible. The decision to appoint the COAS gets complex when seniority, career progression, professional competence, command abilities, general reputation and loyalty factors are considered in picking the next COAS. Moreover, it might be under consideration if officers who have only five or six months left for retirement should be given three more years as COAS or officers who still have at least a year of service left should be appointed so that a new battle hardened cadre of officers run the affairs of the Army. To better understand this decision making, following are the brief profiles of at least the top five senior most Lieutenant Generals, with the hope that the PM does not throw another surprise by going beyond the list of top five senior most three star generals in picking his next chief. If he follows such a course, it would set in a number of early retirements even for officers who have a few years of service left as they may not prefer to serve under someone junior to them. 1- Lt General Haroon Aslam: Lt General Haroon Aslam is a commando of the Special Services Group (SSG) of the Army who joined the Azad Kashmir Regiment in 1975 and the SSG in 1981. Lt Gen Aslam enjoys a good professional reputation in the army. As GOC SSG in 2009, Lt Gen Aslam was amongst the first group of soldiers to land at the highest battle ground of Swat amidst heavy gunfire from militants. Leading from the front, Gen Aslam and his commandos managed to regain control of Taliban strong hold of Peochar in Swat after battles which could serve as lesson in world’s military history in high altitude mountain warfare. Promoted as a Lt General in April 2010, he commanded the Bahawalpur Corps and was posted as Chief of Logistic Staff (CLS) in January this year. His appointment CLS raised a few eyebrows in the drawing rooms where the most favouite past time of a few officers is to speculate about promotions and postings. CLS is generally considered to be an unimportant position to be elevated as the COAS, especially for someone who has been enjoying the limelight in all the important positions throughout his career, especially after October 1999. In October 1999, the then Brigadier Haroon Aslam was serving as Director Military Operations and was part of the earlier meetings and plans to secure the PM House and the President’s House. Like other officers who were instrumental in implementing the counter-coup, General Musharraf promoted Brigadier Haroon Aslam to the rank of a Major General in January 2005. Major General Aslam served as GOC Quetta and in April 2007 was given the important task of DG Rangers Punjab by Musharraf. As DG Rangers Punjab, Lt Gen Aslam was instrumental in reaching a number of agreements with his Indian counterparts for release of prisoners and issues related to human and drug smuggling and coordinated patrolling of the international border. If the decision to make CJSC or COAS is made purely on seniority principle, Lt General Haroon Aslam would top the list after retirement of Lt General Khalid Nawaz Khan and Lt General Muhammad Alam Khattak in first week of October. However, the final decision will be made by PM Nawaz Sharif who is likely to hold the portfolio of the Defence Minister atleast till high level appointments are made in the defence forces. Lt General Haroon Aslam is due to retire on 9th April 2014, approximately six months after October when the incumbent CJSC is due to retire. 2- Lieutenant General Rashid Mehmood: As far as promotions are concerned, Lt General Rashid Mehmood has been sharing the glory with Lt General Haroon Aslam on two important occasions, on the same day. The then Brigadier Rashid Mehmood was serving in the United Nations when General Musharraf decided to promote him as a two star General in January 2005. Lt General Rashid and Lt General Haroon Aslam also shared the glory once again when General Kayani promoted both as three star generals in April 2010. However, similarity between the two top generals, who are being tipped to be the senior most in October for appointment as CJCSC and COAS, ends there. Lt General Rashid is said to enjoy good reputation with the Sharif family, courtesy the former President Rafiq Tarrar and his stint as Corps Commander Lahore when he interacted with the Sharif brothers in official capacity. Lt General Rashid, who also served as Military Secretary to ousted President Tarrar, was given the strategically important post of Chief of General Staff (CGS) earlier in January. Belonging to General Kayani’s Baloch Regiment, promotion of Lt General Rashid as CGS is being considered as Army Chief’s choice by the incumbent COAS as many an army chief was promoted from the same post including General Yahya Khan, General Mirza Aslam Beg, General Asif Nawaz and General Jahangir Karamat, to name just a few. One of the reason given for Lt General Rashid being a hot favorite for the post of COAS is his stint prior to being the CGS as Corps Commander Lahore. The tenure as Corps Commander Lahore helped to create a good impression in the mind of Sharif brothers as junior Sharif frequently interacted with Lt General Rashid in his capacity as Chief Minister. Prior to this, in the crucial and active phase of the war against terror, the then Major General Rashid Mehmood served as Deputy DG ISI to coordinate intelligence operations while some of his contemporaries were active on the war front and leading the troops from the front. However, it is said that giving the important portfolio of CGS to Lt General Rashid, General Kayani has stacked the deck of cards favourably for an officer of his own regiment by giving him the prized position of looking after both military operations and military intelligence. In view of this, it is not difficult to guess the institutional recommendation might favor Lt General Rashid. But it remains to be seen if PM Nawaz Sharif would decide to go by General Kayani’s choice and appoint Lt General Rashid as the COAS or pick his own chief for some other considerations of merit and professional competence other than the seniority principle alone. Moreover, the PM will also have to consider the political fallout of appointing someone who served as Corps Commander Lahore when the same criticism is being faced in political and bureaucratic appointments. Also, it is rare that two successive Chiefs are appointed from the same regiment. Till the PM takes the final decision, all the analysts are putting their bets on Lt General Rashid as the next successor to General Kayani or atleast to be the CJCSC. Lt General Rashid would still have five months of service after retirement of General Kayani on November 28, 2013. 3- Lt General Raheel Sharif: Third in the seniority list post October retirements, Lt General Raheel Sharif is younger brother of Nishan-i-Haider Major Shabbir Sharif Shaheed. Promoted as a Lt General in October 2010, he was first entrusted to command the Gujranwala Corps and later appointed as Inspector General Weapons, Training and Evaluation. As a two star general, he commanded the 11th division in Lahore and was later posted as Commandant Pakistan Military Academy Kakul. It was a surprise for some when Major General Raheel Sharif was promoted as a three star general as it was thought he had already reached the peak of his career. However, some sources say, Lt General Raheel Sharif is known to Lt General (retired) Abdul Qadir Baloch, a close confidante of PM Nawaz Sharif. If the PM consults his cabinet for the suggestions, Lt General (retd) Abdul Qadir Baloch is said to be favorable to an officer who served under him and is known as a simple career officer. However, this relationship would not be given much weight when the PM takes the final decision based on considerations of merit, professional competence and dynamism to tackle the challenges of militancy and withdrawal of international forces from Afghanistan. He is expected to retire in October 2014. Belonging to Tank in South Waziristan tribal Agency, Lt General Tariq Khan is credited with making significant gains in the war against militants in the restive tribal areas and making FC a fighting force to reckon with. He has tried to remodel the FC into quick reaction force commando units. Officers and men hold him in high esteem for being with them on the battle fronts and his ability to quickly take decisions. Anyone visiting the tribal areas and talking to army soldiers hears tales of valor of Lt General Tariq Khan, especially in routing out the militants from Bajaur, South Waziristan, Dir, Mohmand, Swat and Buner. From 2008 onwards, when 14th Division was moved under his command from Okara to fight militants in Waziristan, the military made significant gains to reclaim the territory lost to militants. Commanding the FC in the difficult operations to clear militants from Bajaur, Lt General Tariq Khan was found leading the operation from the front lines, standing with young Captains and Majors to clear Loi Sam and other areas in the militant strong hold on Pak-Afghan border. In South Waziristan, he broke the myth of invincibility of militants and re-established the lost credibility of Army and FC as a fighting force in the area. Prior to that, Lt General Tariq Khan commanded the First Armoured Division in Multan in 2006-2007 where he was posted following a successful stint as Pakistan’s representative in US Central command in 2004-2005. Lt General Tariq is the only Pakistani Army officer in addition to General Kayani who was awarded the US Legion of Merit for his outstanding performance in joint Pak-US Operation Enduring Freedom. Prior to that, two Pakistani naval chiefs, Admiral Shahid Karimullah and Admiral Afzal Tahir had also received the prestigious award. When it comes to pure merit, operational command, battle experience and professional work for uplifting the units, Lt General Tariq may be considered as a powerful choice by PM Nawaz Sharif. If the PM decides to opt for Lt General Tariq, he would be able to ward of allegations and criticism of giving all important political and bureaucratic posts only to those who have some linkage with Lahore. Moreover, as the US and international forces withdraw from Afghanistan in 2014, it would be beneficial to have a COAS who has hands on operational field experience of formulating policies to effectively deal with the menace of militancy and the larger issues involved in Afghanistan’s transition. This entry was posted in Politics and tagged COAS, Nawaz Sharif, Pakistan Army on July 11, 2013 by akhterhayatmalik. Egyptian Army has toppled the government of President Mohamed Morsi on 3 June 2013. Morsi had become the first elected president of the country after a successful revolution removed Hosni Mubarak from power and hence made an end to a series of dictatorial rule in Egypt. Mohamed Morsi won 52% of the vote against 48% for Ahmed Shafiq, a former air force commander who was seen as a counter-revolutionary candidate representing the deposed Hosni Mubarak. Morsi enjoyed support of Muslim Brotherhood (MB) who are considered pro-Islam but are not extremists. 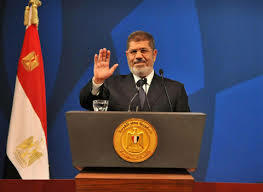 Morsi has promised good governance, rule of law, equality and justice for all and progression of democratic norms. However Morsi had failed to deliver and fell much short of the expectations of the people. Some of the criticism against Morsi includes his obvious tilt towards MB while running the country. He appointed seven governors from MB and tried to induct large number of MB persons in state institutions. He tried to influence the media with MB doctrines which many people in Egypt did not like. Morsi should have shown more courage and magnanimity to accommodate diverse views and opinions of different groups and parties. The worst hit sector was economy which saw a sharper decline during Morsi regime. Morsi could not address the acute problems like power shortages, unemployment and corruption from the country. Though Morsi displayed some appreciable personal examples like austerity and refusal to have any protocol but the Egyptian people wanted more than these cosmetic actions. Some political analysts have tried to tag reasons of Moris’s downfall with non cooperative attitude of the US and IMF who had refused to release a bailout package to Morsi government. Are we being made to believe that any government must have a begging bowl in its hands and must appease the international donors for its survival? Egypt is a dynamic and progressive society, mostly urban based, with very little inclinations towards extremism. They are tolerant and have the potential of making rapid progress. But the onus to bring such revolutionary changes squarely lies with the leader. There is no doubt that President Morsi failed to mobilize the Egyptian nation to achieve their coveted goals of progress and prosperity. There was ample time available with Morsi to read the minds of people and get a feel of their thinking. He should have displayed political acumen to ward off any threat to democracy which was looming large in the shape of growing unrest and protests on the streets. Even after the Army gave 48 hours deadline he should have announced a caretaker government and holding of fresh election by himself. No doubt America, Israel and the West would be more than happy to see the downfall of an Islamist leader in an important country like Egypt and they must have exploited the situation to their advantage also, but for this no one else except Mohamed Morsi is to be held responsible. This entry was posted in Politics and tagged Egyptian Army, Mohamed Morsi, Muslim Brotherhood on July 5, 2013 by akhterhayatmalik.